Memory foam pillows are wildly popular nowadays for many reasons. They’re comfortable, supportive, and becoming more affordable as time goes on. Some people even purchase them as a status symbol. This may sound crazy, but it’s true! Everybody knows the name Tempurpedic. Tempurpedic pillows are one of the pioneer brands that first produced memory foam pillows. Their pillows were made with viscoelastic materials, and they are still one of the most popular brands today. So here’s the question; why would you choose a Tempurpedic pillow instead of other brands? Why is that brand better than other brands like Sleep Innovations or Sleep Better? Today’s mission is to answer those questions for you! The patented TEMPUR material on Tempurpedic pillows is technically a memory foam pillow. However, there is one major difference. The TEMPUR material will bounce back to its original shape after each use. One of the main complaints people have about memory foam pillows is that they use their shape. Nobody wants a flat or awkwardly shaped pillow. The fact that Tempurpedic pillows keep their shape is why so many people love them! 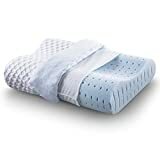 This unique quality of the TEMPUR material alone increases the overall value of the Tempurpedic pillows since it will mean that your Tempurpedic pillows will have more longevity over your generic memory foam pillows. The TEMPUR material is not all about longevity either, as it is very well-designed for comfort. You can expect it to contour to your body according to your body temperatures, as with other memory foam pillows. However, the TEMPUR material is composed of millions of individual memory foam cells, making weight distribution even better for both comfort and support. Another common problem with memory foam pillows is the chemical smell. This is because the viscoelastic materials contain polyurethane. This chemical odor is especially prominent when you are just unwrapping them, and can last for at least 48 hours. Some memory foam pillows are even worse, with the chemical smell never totally went away even after years of use. Well, Tempurpedic pillows, which are technically memory foam pillows, still project the same smell, but it is much less compared to other brands in the market. Even better, the chemical smell for Tempurpedic pillows will only last for a little while, in most cases less than 48 hours. You can air out the Tempurpedic pillows in the open to speed the process. Why is it? The TEMPUR material is made with a proprietary method, which eliminates some of the chemical odor associated with most memory foams. Another great value. Besides comfort, the aim of having memory foam pillows is to have a better support for your head, neck, shoulders, and spine during your sleep. We all know how back and neck pain after sleep can be very disturbing (and painful), so the good news is: Tempurpedic pillows bring even better support compared to your average memory foam pillows. Again, the quality of the TEMPUR material plays a great part, as it is well-researched to provide better, well-distributed support throughout your neck, back, and shoulders. As a result, Tempurpedic pillows offer better spine alignment throughout the night, preventing pain and injuries. Tempurpedic pillows also feature better hypoallergenic materials, so they are perfectly safe for you who are suffering from allergies or asthma. For health purposes, Tempurpedic pillows are definitely some of the best pillow options you can get in the market today. It’s true, Tempurpedic pillows aren’t the cheapest on the market. However, you know that you pay for quality! Think back over how many times you’ve been disappointed by cheap memory foam pillows. They’re uncomfortable, easily get lumpy and lose their support very quickly. Tempurpedic pillows provide a nice balance of price and quality. They are not the most expensive and certainly are not overpriced. With fairly affordable price tags, they provide great features and overall quality. Pair that with the fact that the TEMPUR material is extremely durable. With good care, Tempurpedic pillows can even last for 10 years without much degrade in form and quality. With those facts, buying Tempurpedic pillows are sound investments, as you can see from many reviews from satisfied customers. Tempur-pedic is among the best companies in providing customer support and warranty. Meaning, you wouldn’t have to worry about product defects or accidents. Tempurpedic pillows are covered with nice 5-year limited warranty. A 5-year warranty is an excellent coverage plan for pillow products. This warranty covers any physical flaw in the product. It also covers when your pillow loses shape. If your Tempurpedic pillows come with product defects, Tempur-Pedic will accept no-question return policy. So, you wouldn’t have to worry about buying Tempurpedic pillows, as your investments are protected very nicely. In our previous article, we’ve given your our Tempurpedic Pillow Buying Guide. This time, we will deal with one of the most frequently asked questions we have: how to wash a Tempurpedic pillow. This question came because Tempurpedic pillows are memory foam pillows, made of the very delicate viscoelastic gel. One cleaning mistake, and you can ruin the comfort of your Tempurpedic pillow. Yet, you shouldn’t be afraid anymore, since we have compiled an in-depth guide of how to wash a Tempurpedic pillow, including how to easily remove unwanted odors and persistent stains. Without further ado, let us begin with what you shouldn’t do. Above all else, never put the memory foam pillow washing machine or dryer, it is one of the worst things you can do to the Tempurpedic Pillow. The included cover, however, is machine washable. After we have established the don’ts, let us then discuss the actual method. For regular cleaning and eliminating odor, here are simple steps you can follow. Remove the cover of the pillow. Most, if not all Tempurpedic pillows provide included machine washable cover. However, for most situations, you can simply wash the cover in cold water with only mild soap. This step can also be done for Tempurpedic Pillow Protector. One thing to keep in mind about cleaning the cover is not to over-dry it. Dry it with the lowest possible temperature in the dryer, or simply dry it on a clothesline. With the pillow cover removed, roll the pillow like a sleeping bag and release. Repeat to roll up in the opposite direction and release. It is better to do it outside and expose it to the sunlight. This important step will ventilate the memory foam material of the pillow. After the pillow cover is completely dried up, put it back on the pillow. If your pillow has any unpleasant odor, sprinkle a little baking soda. Let it stand for a day, then shake the pillow. You can also use a vacuum cleaner with the brush attachment. You can put your pillow cover back on after all the baking soda has been cleaned up. Alternatively, you can also expose the pillow to direct sunlight for a day or two. Press the towel on the spill to soak up the liquid. If one towel is not enough, you might want to use several. Air dry your pillow, you want to remove all traces of moisture. Move the pillow to a room with more air circulation, or you can place a fan near it. After the pillow is completely dry, put back the pillow cover on. Removing stains from a memory foam pillow can be really hard, and can damage the memory foam material if you are not careful. However, it is not impossible, and you can try the solution below. Rub it onto the pillow surface gently, start from the outside part of the stain and work inward. Repeat as necessary until you can remove the stain as much as you can. This solution is not guaranteed to remove the stain completely, but you can use a new pillow cover to hide the stain. Try a Tempurpedic Pillow Protector for more protection from stains. To remove unpleasant odor from accidents like spilled pet urine, the best way is to use vinegar or liquid enzymatic cleaner. Remember, though, the memory foam material is not made to get wet, so you should be really careful. Use 50/50 vinegar or water mix. or enzymatic cleaner with a sprayer.